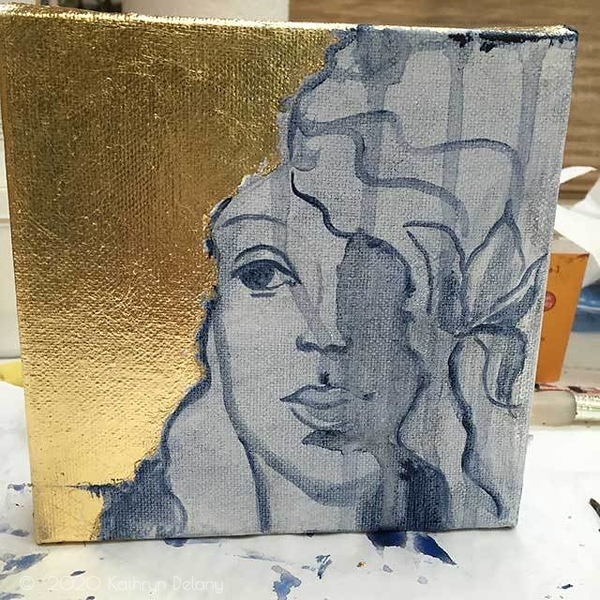 All I know is I wanted to create art with gold leaf for the 2016 Art Adoption Show at http://villagegalleryarts.org/the Village Gallery of Arts in Portland OR, during May. Since I have been doing a lot of work incorporating female portraits, I wanted to combine the two together. The challenge for the Art Adoption show is to raise funds to keep this all volunteer co-op gallery going. A portion of the sales goes to the gallery’s fund raiser. 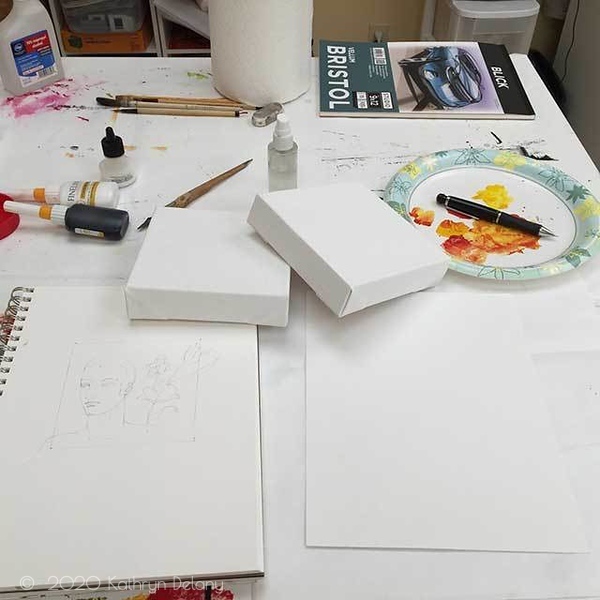 I got 2 small canvases (6″ x 6″ x 1.5″) – all nice and shiny white. All creative people have a fear of a blank page, or as an artist a white blank canvas or sheet of paper. I mean look at this picture. Its scary! With that in mind I had started to sketch out some ideas of what I would like to do on my iPad Pro using the app Procreate – my go to app on the tablet. 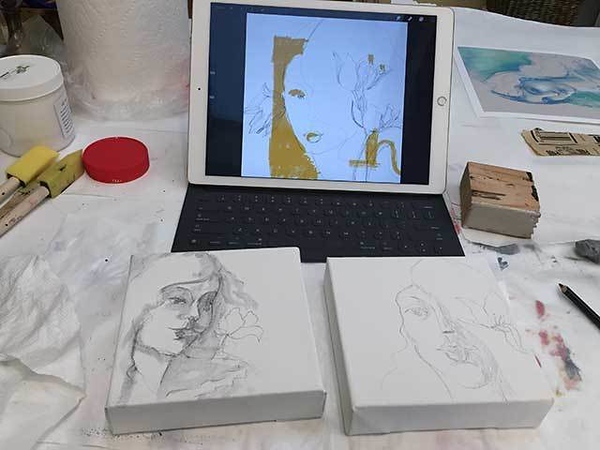 Once I sort of had an idea worked out I drew directly onto my canvas with a water soluble Sketch and Wash pencil – I discovered I have five of them! No, wait I actually have 6! 4 of them are all new in that they are the same length. One is missing from this photo because I only found it after I took the photo! 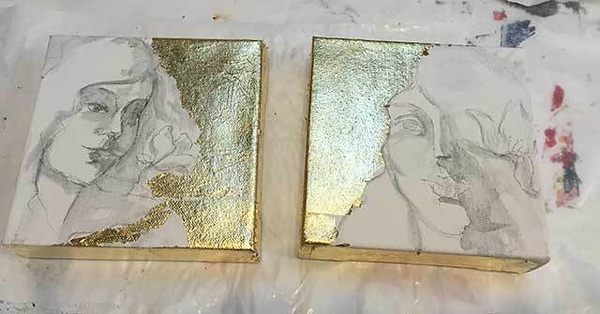 I initially was going to frame each portrait in a square within the square of the canvas but then felt that the composition was better served to have (Dutch) gold leaf take up about 50% of the design. I also added leaf to most of the edges of the canvases. Once I had the gold leaf added, I washed over the ‘sketch and wash’ drawing to give myself a toned drawing work with. 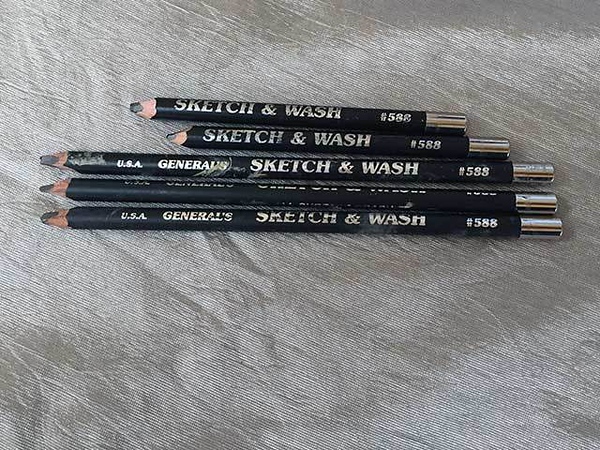 See – getting rid of all the white space. Normally I would have toned the whole canvas before doing anything at all. Love Paynes Gray. So I used Paynes Gray acrylic paint over the sketch and wash drawing to give added depth to the shading for the faces. I also allowed the paint to be dripped just for fun. Initially there were flowers in the compositions. 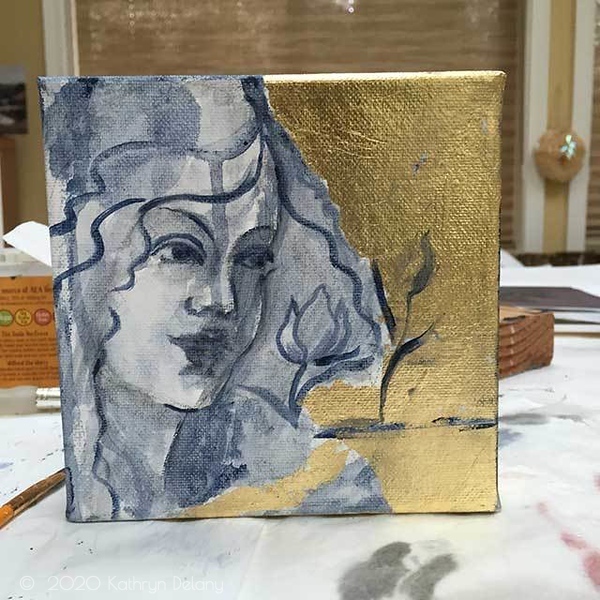 Looking at this stage, I love the texture of the canvas under the gold leaf. Having got this far, I suddenly found myself not sure what colors to use with the gold leaf. I did not want to compete too much with all that glorious shine. So I snapped a photo of one of the ladies with my iPhone and sent it to my iPad and opened it up in the Procreate app. I did a little more brain storming digitally and played with some color combinations. The next image is actually a digital version of what I wanted to paint. 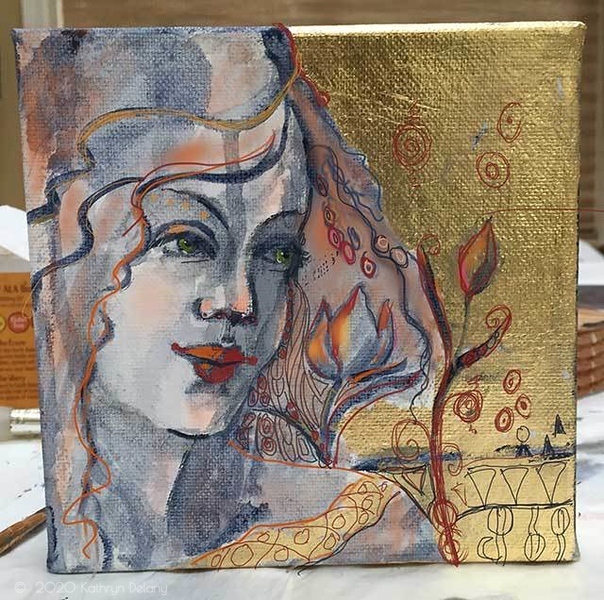 My thought process was that normally if I was doing gold leaf, I would tone under the background with a warm rusty red color to compliment the richness of the gold. You can clearly see how I was going to incorporate spring flowers. 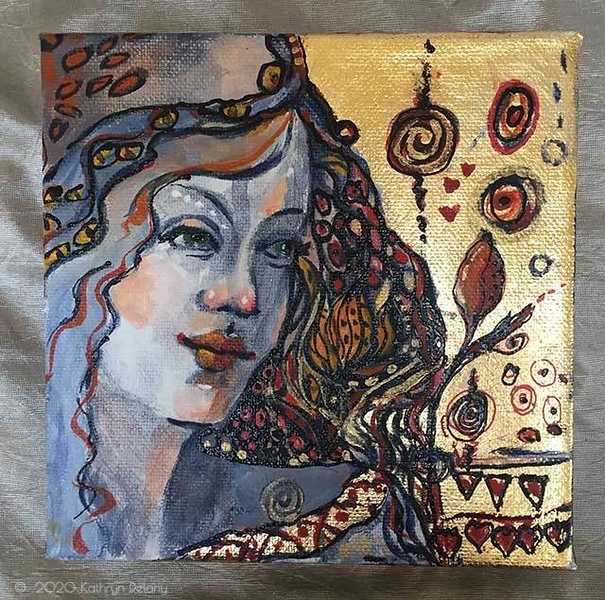 I am also influenced by my love of Gustav Klimt’s works. Looking at this image now, I realize I can actually incorporate a real gold leaf look into future digital art work I do. Eureka! The reason I love this process is that I can figure out problems without having to paint something incorrectly and then ‘fix’ it, by having to paint over it. I also did not want to lose the color of the canvas shining through. Now all that was left was to paint in my chosen colors. Warm peachy colors for the skin. Giving the feeling of porcelain skinned red heads. Did you know I love redheads? 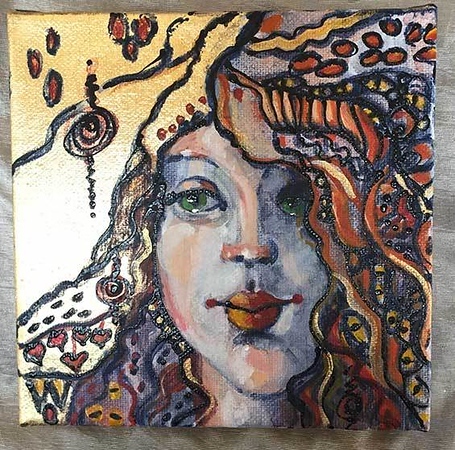 I limited my palette to the following colors: Golden’s Paynes Gray, Diarylide yellow, Cadmium Red Medium Hue, Fluid Red Dioxide and Fluid Titanium White. Martha Stewart craft acrylics Mermaid Teal (love that name), mixed with the diarylide yellow for the eyes. Craftsmart acrylics Terra Cotta and Coral – yes for the skin. Oh and at the last touch Gold Iridescent Gold Deep (fine). For the lines I used Golden Fluid Black in a fine line applicator bottle which makes it feel a bit like a pen. Here are my two Gustav Klimt inspired Ladies. What do you think ? Let me know in the comments below.